I really didn't expect a sci-fi movie starring Vin Diesel to be some kind of uber-outstanding masterpiece, but I thought that at the very least it'd provide enough action to keep me entertained. Oddly enough, it couldn't even do that. Yeah, it did have action, but it all felt unnatural. I didn't believe it, and I also didn't understand why he kept taking the actions that he took, pretty much from the beginning of the movie. It's like he kept purposefully putting himself and the girl he was supposed to protect into harms way... and not just the slightly-risky harms way, but the type of harms way where it's pretty much guaranteed that you're gonna die unless some miracle happens. So Vin Diesel stars as Toorop, some kind of mercenary-for-hire that lives in the post-apocalyptic-like future. Toorop accepts a job, at gunpoint, for some Russian mobster dude. The job is to transport some girl into the United States, where Toorop is a wanted man. Alright... so here I would expect Toorop to just kill the mobster dude and leave, but instead he accepts the job and threatens to kill the mob dude if he betrays him... or something like that. Now Toorop goes and picks up the chick, Aurora, who is some kinda of monetary shut-in who has never experienced life outside her little world. Along for the journey is her guardian, Sister Rebeka. That wasn't part of the job, but Mr. Badass doesn't put up much of a fight about it. By this point Mr. Badass is already looking like kind of a wuss. I mean, who is supposed to be in charge here?! Boring stuff happens until they get to the train station, and then some more boring stuff, and then Aurora freaks and starts running away... then BOOM, the train explodes. Okay, so now we know she's psychic. I guess this is supposed to makes sense at the end of the movie when we learn who this girl really is, but it really didn't for me. At the end I turned to my wife and said "okay... so then what was that psychic business all about earlier in the movie?" and she just shrugged. Let's see, what's next... there was this scene in a club or something where Toorop decides he wants to take on a whole bunch of bodyguards. Yeah, that's the best way to protect this girl, pick a fight with a bunch of angry muscleheads eager to break something... or someone. Somehow they escape that, then... I think it was a mad dash to a submarine where they just hope that they can get aboard and won't die. Ah, then some more psychic stuff, which I still don't get. I'll stop here 'cause the movie just keeps going on like this. Sometimes a cool ending can make up for a dull film, but this ending is anything but cool. As for the Special Features, they are decent. 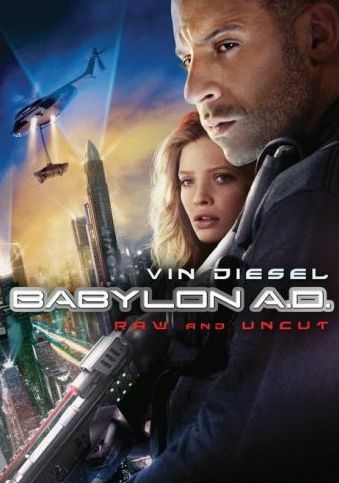 Babylon Babies provides more insight into the book on which this movie is based, while Arctic Escape shows how they came up with the whole Arctic action sequence... and what's weird is that the real footage they show here is way WAY more interesting than the action sequence in the movie where they are trying to escape from some silly robotic jet fighters. Fit For The Screen is a typical behind-the-scenes featurette, nothing special. Hummers In Flight shows the making of a car chase scene, which is pretty tame compared to other car chases and explosions we've seen. Probably why it became a deleted scene. It's mostly just cars driving. By the way, did you know it's possible to easily punch your fist through a car window without feeling any ill effects like glass in your hand? Yeah, totally possible... in the movies. Prequel To Babylon A.D.: Genesis of Aurora is a five minute long animated sequence that tells the backstory of Aurora. The animation is simple, looking like it was done in Flash. Keep it until after you've watched the movie unless you want to find out ahead of time what makes Aurora so special. Plus, if you watch it beforehand, then you'll spend the movie wondering why all parties seem to have no disregard for Aurora's safety when the animated featurette clearly shows that everyone wants her alive. In conclusion, you can skip this one.